​​​​​​​​​​​ ​HOUSTON AREA – Several of area’s institutions for higher learning will soon break ground on multimillion-dollar projects. School officials cite increased enrollment and aging campus facilities as reasons for the campus improvements. Transportation Technology Center: a $12.9 million, 15,000-sf facility. 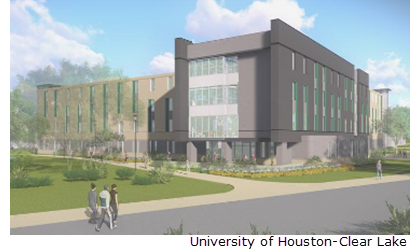 The University of Houston–Clear Lake will break ground June 2018 on a $21.4 million residence hall set to open in time for fall 2019 semester. a $30.1 million South Campus Engineering and Technology Center. Petrochemical Energy and Technology building, set to be complete by May 2019.